Four hundred kilometres southwest of Darwin, in the Aboriginal community of Wadeye, there are signs of a community-led movement to stop rheumatic heart disease (RHD); thanks to one grandfather who doesn’t want to see any more young people experience what his grandson went through. 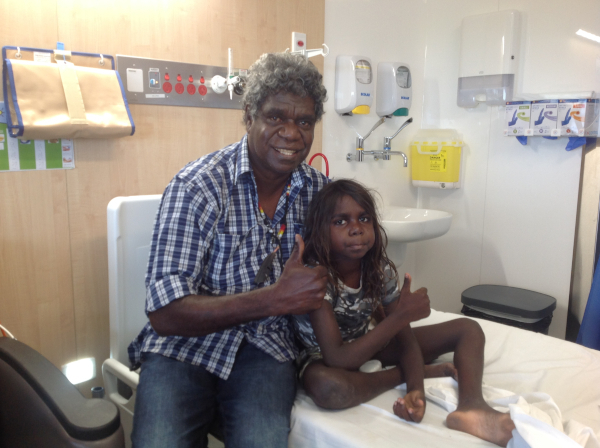 Maringarr man William Parmbuk recently returned to Darwin after escorting his eight-year-old grandson, Jeremy, to the Royal Children’s Hospital in Melbourne for open heart surgery to repair a faulty valve caused by rheumatic heart disease. “This was Jeremy’s first time on the big plane – an eye opener for him. Jeremy understood the situation. He was very brave. He had surgery in early December and then back to Darwin. We’ve been in hospital for a couple of months. “After the experience I saw, I’d like to continue working with kids with rheumatic heart fever in my community in Wadeye”, William tells RHDAustralia. For William, it was an experience that he wants other children and community members to know about. He wants to go back and help his community find ways to stop rheumatic heart disease. “I will continue working with some of my families in Wadeye and mums and dads and kids who have heart disease to help them out and get their heart checked out”, William says. It was William’s interest in helping his community that was the catalyst for many conversations with RHDAustralia and key community leaders in Wadeye. These conversations led to a series of initiatives, some of which are still in the planning phase but one which intersected perfectly with a program that is now running; the Champions4change program. The Champions4change program was designed and developed by community members affected by acute rheumatic fever (ARF) and RHD. Champions may be people with ARF or RHD, or someone caring for them. They come from across the country and play many roles in their communities. They are mums, dads, grandparents, siblings and friends, Aboriginal health workers and practitioners, nurses and carers. They’re leaders in their community who are concerned and want to prevent ARF and RHD in young people. Because of William’s advocacy, two Aboriginal health workers came to Darwin to take part in a Champions4change workshop on the 6th of March. While we were keen to have William participate, he was unfortunately unable to make the trip, but we hope to involve him in future Champions4change activities and some of the other initiatives planned. But even though William couldn’t attend he still had a few key messages for those with children who may have ARF or RHD. “You know how kids fall down and pretend to be sick or fall down and pretend to have a sore leg or sore hip. We thought that’s what Jeremy was doing. We thought he was just pretending or it was from playing football. “Before he had rheumatic fever he was a happy boy, but when the rheumatic heart fever come he was cranky and crying. “Then he had the fever and was wobbly. When he was hot he would come in and sleep with us. When he was healthy, he never did that. “When he got the fever we took him straight into clinic and they told us he had rheumatic fever. Other families need to know they need to go to clinic. “But then he never stops crying so we go back to the clinic and they looked at his heart. That’s when we learn he has a problem with his heart and we go down to Melbourne to fix him up. “I thank the doctors who worked on Jeremy, the nurses at Wadeye, Royal Darwin Hospital and Melbourne Children’s Hospital. “And remember, don’t keep your kids at home who has a bad heart before it’s too late. Just take them to the clinic first and then get the doctors to check them out”, William says just as Jeremy comes into the room to collect him for his meeting with Dr Bo Remenyi. Thank you to William for taking the time to speak with Murmur and thank you to all the community members in Wadeye who have been in contact over the past couple of months. Exciting new community-led programs will be announced in the near future.